Lin was down the last couple of days with a heavy-duty migraine, and I headed north of here 15 minutes by bus to Mancora, Peru, to buy some pain medications. Also, the surf report yesterday had forecast some waves in Mancora and I wanted to get some photos for my blog on our other website, Inside-Peru.com. After buying some meds, I would head for the beach. Our regular pharmacy in Mancora was… gone! Another one we use across the street said they had just closed up and left. Hmmm. Well, I did find some pain medications and placed an order for more. Now I was ready to check out the beach for a few minutes. First, I had to try to find some rechargeable AA batteries for our camera, as I was afraid the old pair I had was not holding a charge well. However, I ended up not finding any rechargeables and wanted to get to the beach before the wind picked up, so settled for 2 non-rechargeable batteries (which I ended up not needing for the few photos I took anyway). Although Mancora, Peru, is not the best beach for sea glass, you can see in the included photos that one never knows; there are nice surprises. Anyway, I was able to adequately impress here with what I found in about an hour and a half. For once. "Tomorrow's a busy day, we've got things to do, we've got eggs to lay, we got ground to dig and worms to scratch, it takes a lot of settin' gettin' chicks to hatch." ~ from Ain't Nobody Here but Us Chickens, Louis Jordan, ca 1949. If my chick (Lin) is feeling better tomorrow, we may head to Mancora again to do some scratchin'. I'll take my surfboard, catch some waves, and Lin can do some settin'. Hopefully, she will hatch up some other good finds. 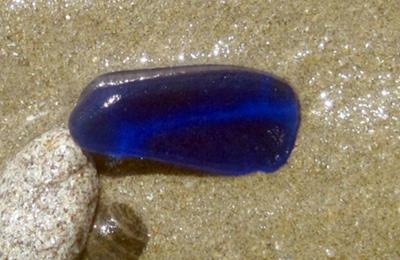 The really interesting piece of sea glass I found today is the cobalt blue piece. In the past, we have never found a large piece of cobalt blue. It just seemed that the cobalt weakened the glass or something because our cobalt pieces were all fairly small. But this once was big and thick (not good for jewelry, but a nice collectible). It is about 2 inches long, very thick, and must be a bottle bottom. However, the sides are not round. As you can see, it is slightly curved with a sharper curve at each end. The curves, however, aren't symmetrical, so we are scratching (our heads) over what shape the bottle bottom was. Anyway, If you have any opinions as to what this might be, post it here in comments. Awesome deep dark blue color...Nice! 15 1/2 to 16" would be a good length. Use brass or copper wire. All I can say is WOW!! BeAuTiFuL! !